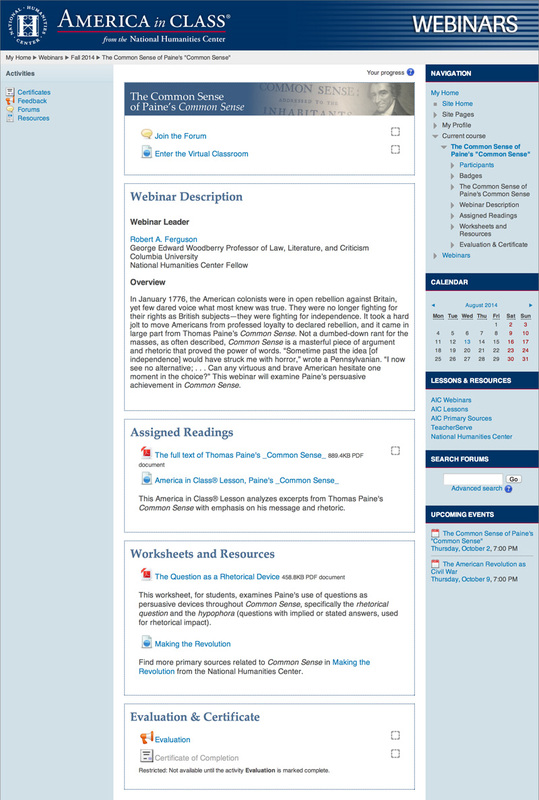 An example of the webinar home page. 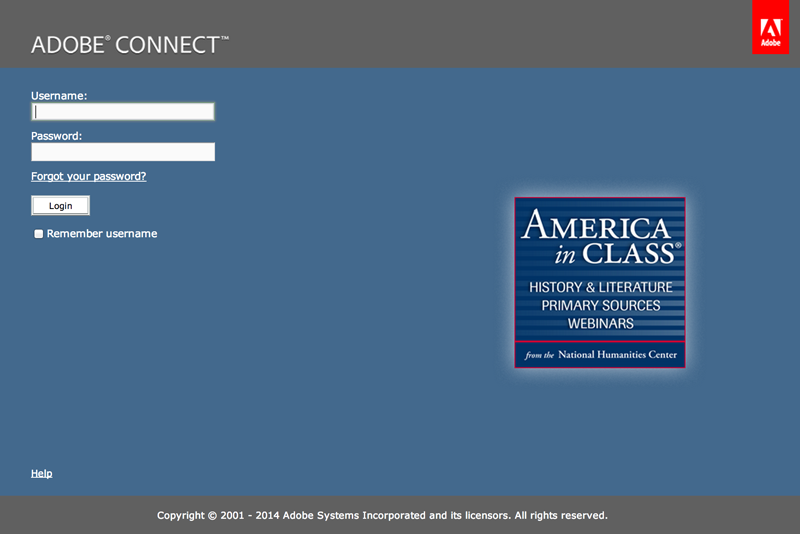 Thank you for your interest in an America in Class® webinar. We want you to have the best possible professional learning experience. Please review the information and videos on this page to insure you have the necessary technical information before logging in for your webinar. Before each webinar you will receive an email message with a link to the webinar home page. You must confirm your participation by joining the webinar discussion forum. Most computers have everything needed to attend an AIC webinar. However, we strongly recommend that you test your computer’s compatibility prior to the webinar date, by using the Connection Test provided by Adobe Connect. If you are having difficulty running the test, or are unable to join Adobe Connect, please refer to Adobe Support. Participants need Adobe Flash Player 13.0 or higher. Download the current version of Adobe® Flash® Player. Logging in to the online classroom. On the date of the webinar, connect to the classroom by clicking the “Enter the Virtual Classroom” link on the webinar home page. Please connect at least 15 minutes before the webinar’s start time so we can assist you with any possible audio or video issues. Once on the connection screen, please submit your first and last names before clicking “Enter Room”. Once you have entered the online classroom, you can initiate the Audio Setup Wizard and select the form of audio you wish to use. At the top of the screen click on Meeting > Audio Setup Wizard. Audio help for VoIP (Voice over Internet Protocol). After the webinar, the audio recording and presentation are available for listening, viewing, and downloading from the webinar webpage. For further information, we recommend the following video guides from Adobe Connect. Attending a Meeting Using a Tablet: This PDF guide will show you how to attend an Adobe Connect meeting using a tablet. Attending a Meeting Using a Smart Phone: This PDF guide will show you how to attend an Adobe Connect meeting using a smartphone. View or download our FAQ document as a PDF. If you have further questions or would like additional information, please contact Libby Taylor at etaylor@nationalhumanitiescenter.org or at (919) 406-0122.